Our last day in China. Free time in the morning went quick. 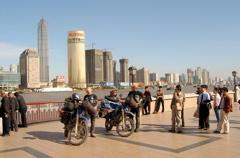 Some of us walked along the Bund, others went to visit the Jade Buddha temple and the tea shop there. There wasn't much time since we had to leave at noon. If you weren't tired when you woke up, you were now. As we were checking out we said good bye to the memebers who are traveling longer. We said good bye to Robert who was also staying a few days longer. And finally we had to say goodbye to our national guide Sunny. He was our hero and our support, we were sad to say goodbye. Today was a well-needed slow day. 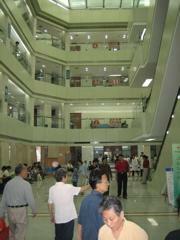 The morning's plan to visit a large TCM Hospital was rejected due to some miscommunication. The hospital was obviously going through some serious changes and reconstruction. With that came a rather exclusive attitude, especially to foreigners. They were only going to let us stay for about a half hour instead of three. That wasn't the plan and it wasn't good enough. So we canceled and left. However, a few hours later, we scheduled another visit with a different TCM clinic for the next day. We were relieved to find a quick substitute, since many members were excited about seeing medicine practiced in China. It all worked out for the best, since several people were feeling tired and probably needed a slow day to recover. After a drive in golf carts around the park, the remainder of the group opted out of visiting the nearby temple in exchange for going back to the hotel early or visiting "electronic alley," a place for pirated software and knock off electronics and cheap MP3 players. It was packed and definitely catering more to the local crowd's needs. After dinner the group Split up to go back to the hotel, out shopping, visit the local Pizza Hut (which is more like a fancy, expensive restaurant in China, not fast food; even though it still is) or out to a nearby nightclub. For those who went to the nightclub, it was another night of dancing. The dance floor however, was tiny and packed with locals, who were very interested in our presence. After a few beers, many of them were coming over to practice their English on us. It's hard to be hidden in place like that when you're white and 6'3." After the dancing and bizarre variety show interludes with dancers, crappy live bands and a drag queen, we took taxis back to the hotel in the rain. It was a great night together. We arrived in our new hotel, which was a huge 4 star hotel holding a computer conference. Although the hotel was packed for the weekend, we could tell that we were going to be spoiled here. After check-in, we went to the Nanjing Botanical gardens nearby. This is where Robert worked a lived fro a few years. We got to meet some of his old friends and teachers and pretty much had the whole place to ourselves. We spent a few hours there going over the many different medicinal herbs, many of which Robert originally planted there in 1997. It was a lovely garden that had a new teahouse built to relax in. After sipping tea for a bit and playing with some of the local kids (balloons are a huge hit with the kids here) we went back to the hotel. Dinner was in the city downtown, which is a decent drive from the hotel. After the meal we had free time to walk along a promenade. It was Friday night, so all the shops were open late. Here you can find anything... pirated movies or CD's (good quality ones too for $1US), pet stores, silk stores, gift shops, handcrafts, fast food, etc. It was great to hang out with the locals and haggle at the shops. It was barely enough time to even scratch the surface. After that, it was back to the hotel, where we had to go exploring. The hotel is huge and the nicest one by far on the trip. Some of us wandered around and came across a disco... this disco is like 2 stories underground in what could be the dampest, moldiest part of the city. It looked like nobody even knew it existed! In fact, for a little while, we doubted if it even did. Going down the hallway, everyone was laughing at how surreal the wallpaper and giant mirrors were. The name David Lynch was mentioned a lot when trying to describe it to the others who didn't check it out. Anyway, it was rewarding, we found Coronas and a lit-up disco floor with a video projector behind it. We had the whole place to ourselves, so the Michael Jackson music video marathon began. Who knew we had so many good dancers on the trip?